Dr. Ishmael Parsai, UT professor of radiation oncology, chief of Medical Physics Division and director of the Graduate Medical Physics Program, has been elected a Fellow of the American Association of Physicists in Medicine (AAPM). “I am extremely honored and grateful to have been selected for this award and honorable distinction,” said Parsai, who traveled to a presentation banquet in Vancouver, British Columbia, to receive the award this month. AAPM fellowships are awarded to “senior members of the medical physics community” chosen through a peer-review process, according to Parsai. Fellows must be full members of the association for at least 10 years and be nominated by a chapter or by two Fellows of the association. The nominations come from colleagues who have seen the nominee’s academic, professional, clinical and scientific contributions to the field over many years. Nominations are offered to those who have made significant contributions of service to the organization, advancement of knowledge related to medical physics through original research, leadership in the practice of medical physics, and educational pursuits in the field — particularly in the training of medical students, medical physicists, allied health personnel, as well as medical residents. Dr. Don Frey, professor of radiology at the Medical University of South Carolina and chair of the AAPM Awards and Honors Committee, said Parsai excelled in all of these areas. “I’ve been very fortunate to be here at UT with really brilliant radiation oncologists like Dr. Ralph Dobelbower, our previous chair, and Dr. John Feldmeier, our current chair, with whom I have a number of patents and publications together,” Parsai said. Parsai said his career has been particularly distinguished by two patents he has pursued with Feldmeier. The first involved the removal of a filter used in a machine that emits a beam to target tumors, an alteration that made the beam cleaner and gave it a higher dosage rate without needlessly damaging surrounding tissue. The second patent was for a new generation of radiation detectors and sensors made from large-area photovoltaic solar cell material that allows imaging at both diagnostic and therapeutic energy range better in many aspects, including cost, and all imaging parameters. 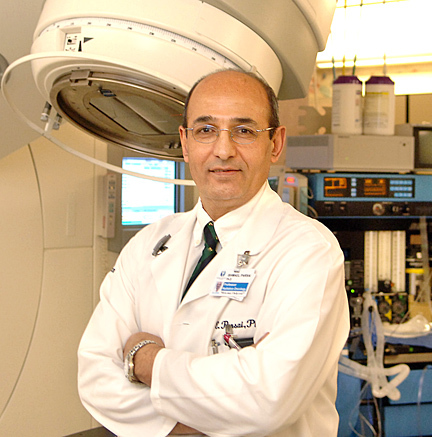 “I am humbled by the honor and take it to heart as an added responsibility to further refine my professional skills in clinical medical physics, teaching and research, and to strive harder to make our graduate program maintain the course of excellence and live up to our reputation to better position our graduates in the field,” Parsai said. In this vein, Parsai said he will work with resources available to him as an AAPM Fellow to increase the educational opportunities available to the students enrolled in the Graduate Medical Physics Program, such as lectures and seminars from professionals in the field as well as other offerings from the related manufacturing sector. “I hope to create a better environment to further expose our students to the latest technological advancements in the field of medical physics,” he said. This entry was posted on Friday, August 26th, 2011 at 4:49 am and is filed under News, UToday .